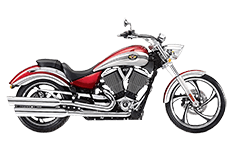 With smooth lines and an aggressively modern engine, Victory's Vegas motorcycle model is the perfect bike for experienced riders. From daily commuting to long-distance traveling, a good set of saddlebags will serve the Vegas rather nicely. Enter the Viking Bags collection – a series of bags designed specifically for the Vegas. In this page, you'll find the best luggage with the best accessories for your motorcycle. Click on each of the models to learn more information, or give us a call and let us know what all you need in on-bike luggage.